Welcome to the Western Arkansas Planning and Development District! Founded in 1966, WAPDD serves the six counties of Crawford, Franklin, Logan, Polk, Scott and Sebastian by providing a variety of resources, services and information. In this role, we assist area leaders and residents in areas like community and economic development, workforce development, transportation improvement, emergency 911 services and much more. Explore what WAPDD is already doing for Western Arkansas, and what we are ready to do for you today! LITTLE ROCK, Arkansas (October 18, 2018) – Hatfield was one of 16 cities and counties presented awards totaling more than $3 million by Gov. Asa Hutchinson at a ceremony Oct. 18 at the State Capitol. The City of Hatfield received a $100,000 grant for bridge replacement on Buddy Bean Drive. 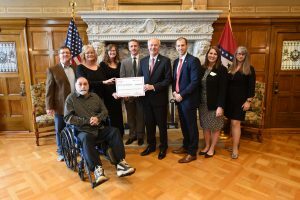 The funds originate from the U.S. Department of Housing and Urban Development through the Community Development Block Grant (CDBG) State Program for Small Cities and are administered by the Arkansas Economic Development Commission (AEDC) Grants Division. To be eligible for CDBG funds, communities must have a population of less than 50,000 and at least 51 percent of the persons benefitting from the project must be of low- to moderate-income. For more information about the AEDC Grants Division or the CDBG grant program, visit www.arkansasedc.com/grants or call 501-682-7682. December 12, 2018 at 12:00 p.m.
March 13, 2019 at 12:00 p.m.
June 18, 2019 at 12:00 p.m.
September 18, 2019 at 12:00 p.m.
December 11, 2019 at 12:00 p.m.